NOW…FOR THE FIRST TIME, you can take personal pictures of family scenes, children, friends, travels in the thrilling “come to life” realism of full color and THREE DIMENSIONS… at actually less than the cost of ordinary black and white snapshots! 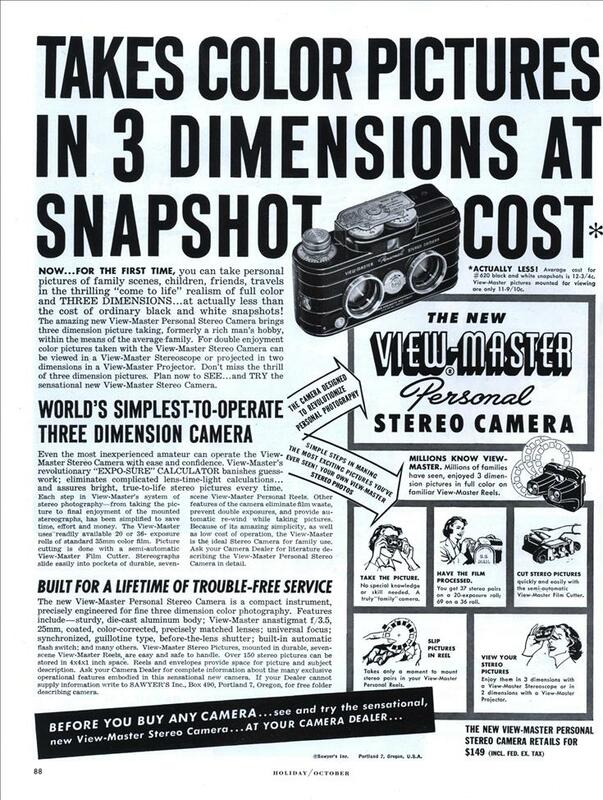 The amazing new View-Master Personal Stereo Camera brings three dimension picture taking, formerly a rich man’s hobby, within the means of the average family. For double enjoyment color pictures taken with the View-Master Stereo Camera can be viewed in a View-Master Stereoscope or projected in two dimensions in a View-Master Projector. Don’t miss the thrill of three dimension pictures. Plan now to SEE… and TRY the sensational new View-Master Stereo Camera. Each step in View-Master’s system of stereo photography—from taking the picture to final enjoyment of the mounted stereographs, has been simplified to save time, effort and money. The View-Master uses readily available 20 or 36- exposure rolls of standard 35mm color film. Picture cutting is done with a semi-automatic View-Master Film Cutter. 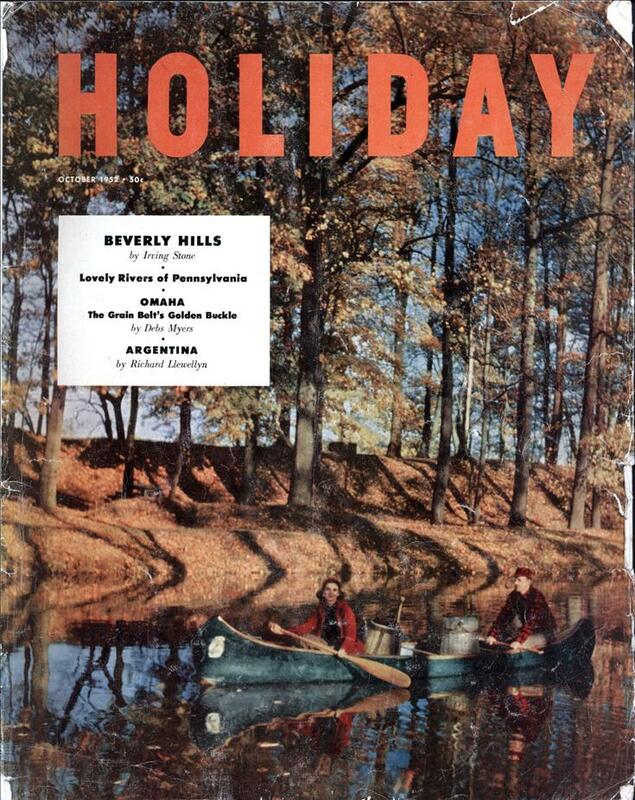 Stereographs slide easily into pockets of durable, seven- scene View-Master Personal Reels. Other features of the camera eliminate film waste, prevent double exposures, and provide automatic re-wind while taking pictures. Because of its amazing simplicity, as well as low cost of operation, the View-Master is the ideal Stereo Camera for family use. Ask your Camera Dealer for literature describing the View-Master Personal Stereo Camera in detail. WORLD’S SIMPLEST-TO-OPERATE THREE DIMENSION CAMERA Even the most inexperienced amateur can operate the View-Master Stereo Camera with ease and confidence. View-Master’s revolutionary “EXPO-SURE” CALCULATOR banishes guesswork; eliminates complicated lens-time-light calculations… and assures bright, true-to-life stereo pictures every time. BUILT FOR A LIFETIME OF TROUBLE-FREE SERVICE The new View-Master Personal Stereo Camera is a compact instrument, precisely engineered for fine three dimension color photography. Features include—sturdy, die-cast aluminum body; View-Master anastigmat f/3.5, 25mm, coated, color-corrected, precisely matched lenses; universal focus; synchronized, guillotine type, before-the-lens shutter; built-in automatic flash switch; and many others. View-Master Stereo Pictures, mounted in durable, seven-scene View-Master Reels, are easy and safe to handle. Over 150 stereo pictures can be stored in 4x4x1 inch space. Reels and envelopes provide space for picture and subject description. Ask your Camera Dealer for complete information about the many exclusive operational features embodied in this sensational new camera. If your Dealer cannot supply information write to SAWYER’S Inc., Box 490, Portland 7, Oregon, for free folder describing camera. *ACTUALLY LESS! Average cost for #620 black and white snapshots is 12-3/4c. View-Master pictures mounted for viewing are only 11-9/10c. When I was a kid I had a ViewMaster viewer and loved it. My depth perception has always been weak, and those images looked more three-dimensional to me than real life. But I never had the camera or used anything but commercial picture discs. I wonder if it can be used for “candid” pictures? Hiru: As much as with any other camera… Well….maybe excluding all wet-plate field cameras. Since “candid” was in quotes, I’ll note that the film had to be developed; it wasn’t a Polaroid. Without the quotes, it is a viewfinder camera, not something bulky and elaborate like an SLR. On the other hand, it was an inexpensive camera – so the lenses weren’t f/2 Ernostars. John S: Googling late Erich Salomon did lead to some interesting sites. Like this: http://www.taunusreiter… Maybe Voigtländer Nokton 1.4/50mm would’ve been more contemporary related to the View-Master camera. I’ve got one of these lovely creatures. The transport mechanism inside the body is something to behold. It shoots on regular slide film, then the chips are cut in a special View Master cutter. Lots of work. I’ve probably made 3 reels with it. But I’ve been getting the hankering of late…. 37 stereo prints on 20 exposers, I was wondering how they did that, at first I thought they used two frames per picture. A 20 exposer roll would only produce 10 pictures, but they obviously must use a single frame for multiple pictures. The frames for these pictures are of a different size than for conventional ones with the type of film used. That’s why there aren’t 40 prints from a 20 exposure roll, only 37; the size is smaller, but it’s not quite as small as half the size. I should also have read the ad more carefully: the lenses are f/3.5, which isn’t overly fancy, but still decent. But one problem is that with this small camera, the lenses are fairly close together. A higher quality camera for stereo photography was the Stereo Realist, but that didn’t prepare pictures for as common and ubiquitous a viewer as the View-Master. Further checking, though, shows that the regular Stereo Realist camera came with an f/3.5 lens as well, although a premium version had an f/2.8 lens. The short-lived Kodak Stereo Camera, compatible with the Realist, also had an f/3.5 lens. The Realist yields by far a superior image, but for sheer novelty this camera is amazing. It arrays each image along the top of the film, with almost no waste between frames horizontally…when the film reaches the end, the lens assembly is lowered to the bottom edge of the film plane and you snap pics all the way BACK. long strip of slide film looks laser-cut when you’ve punched out all the chips! > the size is smaller, but it’s not quite as small as half the size. Actually, the ViewMaster frames were a lot smaller than half size relative to 35mm full frame – don’t forget, each one of those 37 pictures had two frames, left and right.